Inverness Sub Aqua Club call it the ‘Tar Site’ – presumably due to a lump of surplus road surfacing tarmac that has been dumped just beyond the crash barrier. I’ve also seen it referred to in an article by Jane Wilkinson on divernet.com as Sgurr Aoide – the name of the hill this site lies at the foot of. Whatever you want to call it, you’ll find it approximately a mile further on from the signs marking the end of the 40mph speed restriction at Inverinate as you head towards Eilean Donan Castle on the A87. There is ample parking here for several vehicles in a long layby on the side of the road furthest from the loch. You can kit up in the layby or transfer equipment down to the shore and kit up there. It is worth inspecting the path down to the shoreline beforehand as it may well influence your decision making! The top of the path is just to the right of where the crash barrier ends and it is probably best to cross the road here as the traffic moves pretty fast along this stretch. Access to the shore is reasonably easy if you take your time, although exercise caution when the ground is wet! Using a 12 litre rather than 15 litre cylinders might be advisable, if it is an option. As you reach the bottom of the path onto the shore you are facing roughly South East looking along the loch with Ratagan in the distance on the south shore. Getting into the water is easiest at high tide as there is a fair amount of slippery bladderwrack on the shore when the tide is out – not the best for clambering over with heavy gear on. Once in the water, the bottom initially slopes very gradually through an area of seaweed before stepping down over boulders onto an area of sand at a depth of approximately 8 metres. Heading right and descending as you go, you will eventually come across a section of reef that you can follow down to just short of 30 metres. It gets pretty dark so a torch is a must and it will allow you to check for things hiding in the various crevices and under the large boulders that are perched on ledges here and there. There are often dog fish lying around on the bottom doing whatever it is that dog fish seem to spend so much time doing (sleeping?). 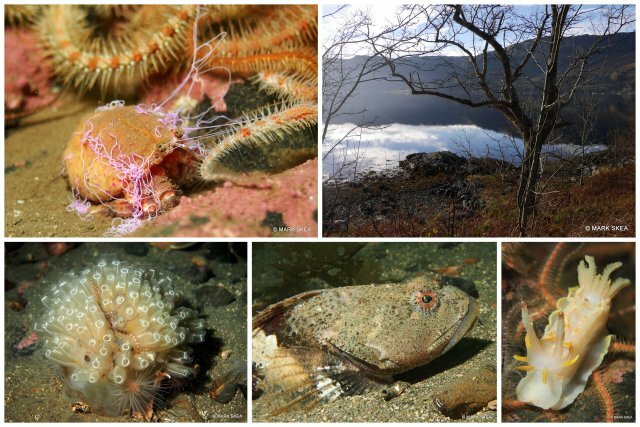 As in many other parts of the loch there are lots of brittlestars around of various kinds and colours. There is an abundance of queen scallops of all sizes with a variety of barnacles, sponges and hydroids growing on their shells. Large and small dragonets scoot around the bottom along with flat fish which I really need to read up on so I can ID them a bit better! There are sea loch anemones dotted everywhere and patches of them have set up home on the stonier areas on the sand. 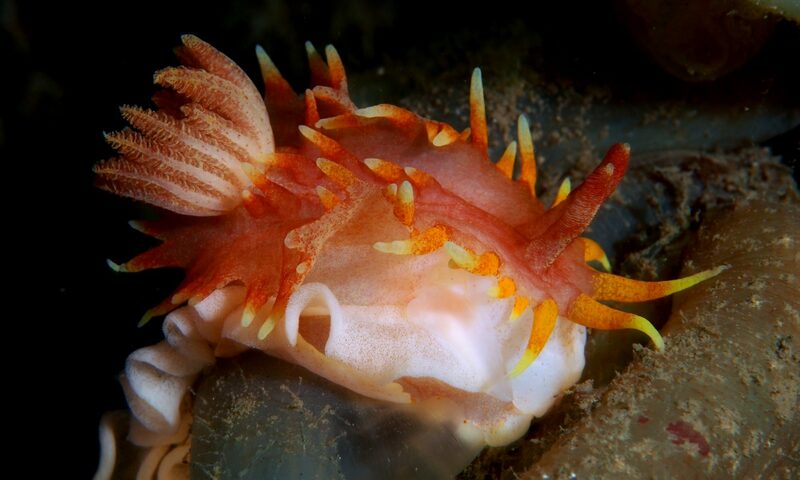 A couple of more unusual spots on this dive were an Imperial Anemone – Capnea sanguinea – and a Yellow Skirt Slug – Okenia elegans (see photos below). Although silty, there is a lot less of it here than in many other areas of the loch, so you are less likely to stop to take a look at something only for your accompanying cloud to catch up with you and envelope everything. We also do a dive several hundred yards along the road toward Eilean Donan castle which has a fairly similar layout and is just as easy to access. That can have a blog post to itself at a later date.